The Johannesburg Central Business District (CBD) caters for a variety of needs to different members of society; there are retail shops, medical practitioners, clubs, churches, traditional healers and so on. But at times, there seems to be tension among members of society with different religious and cultural belief systems. A black man wearing a black suit and a white shirt with a red tie standing outside the church door on Eloff Street preaches in an effort to draw people to get inside the church, while doing so he sees a woman wearing sangoma regalia passing by, he starts shouting holding a mic connected to speakers that people should repent from their evil ways and stop consulting sangomas and seek help from the church. National co-ordinator of the Traditional Healers Organisation (THO), Phepsile Maseko, says pre-colonial Africa relied on traditional healers for physical and spiritual health; however colonisation has made Africans to believe that their tradition and belief systems are “evil”. A Hindu seer who doesn’t want to be identified owns a chemist; she also sells traditional medicine in the area. The chemist is full of different traditional medication stored in bottles and plastics with no labels. The chemist is decorated with horns, animal skin and feathers. The seer who explains that she has no time to waste as she is preparing to do a ritual is reserved about the nature of her work to non-clients but highlights that her only problem in the CBD is with some pastors who inform people that they do evil things. While still complaining about the pastors, an old man gets in and asks two elderly black women sitting next to the door if they still have the muti (medicine) for women, the two women inform him that it is finished and he leaves looking a bit disappointed. The seer also complains about government wanting traditional healers to have certificates as she says her father trained her for the work that she does as a result she doesn’t have a certificate. However, Sibonginkosi Mabena, 48, is more open about the nature of her work. She has had to deal with what most sangomas (traditional healers) deal with when they start accepting their calling to become traditional healers including being “labelled as people who are in the dark” by some religious groups . 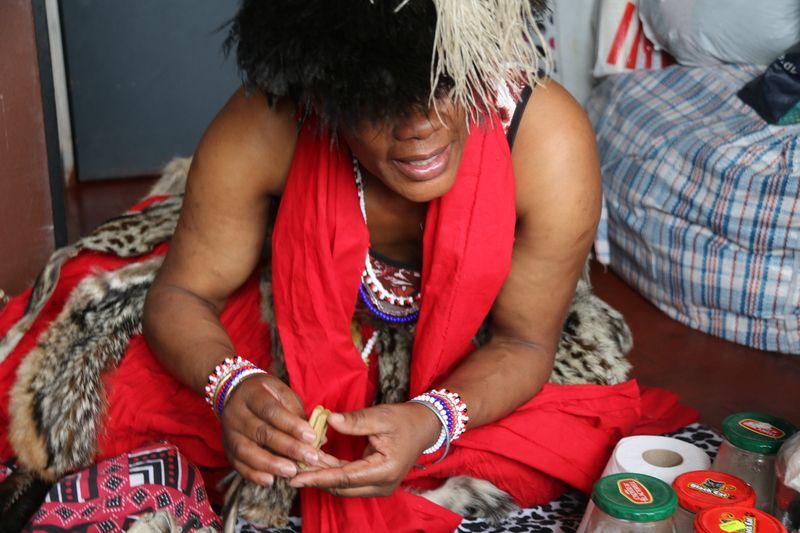 Gogo Linqe (her sangoma name) conducts her traditional healing practice in her apartment at 93 Derry Mansion on Claim Street. The storey building is a few blocks away from the office of the Traditional Healer’s Organisation (THO) (a non-profit organisation that develops policies and provides support to traditional health practitioners) on De Villiers Street. Adorned in blue, red and white beaded necklaces, bracelets and colourful strings on her waist, her appearance draws attention even from by standers across the street sitting on the pavement of the Seventh day Adventist Church on Claim Street. Gogo Linqe has a welcoming smile as she greets with “ Thokoza Gogo” (ancestral greeting). On the way to her apartment, a lady clothed in Zionist church gowns greets her with “nina bakhulu” (the elderly) Gogo laughs and says “thokoza mntanami” (greetings my child). Gogo Linqe seems to be well known in the area as the women selling vegetables on the street also greet her warmly; one asks whether she’s been sleeping the whole weekend as they have not seen her. “Isangom’asilali mntanami siyasebenza,” (a traditional healer does not sleep my child she works) she smiles as she walks.She lives in a two-bedroom apartment with her two daughters; Sakhile (26) and Balenhle (11). 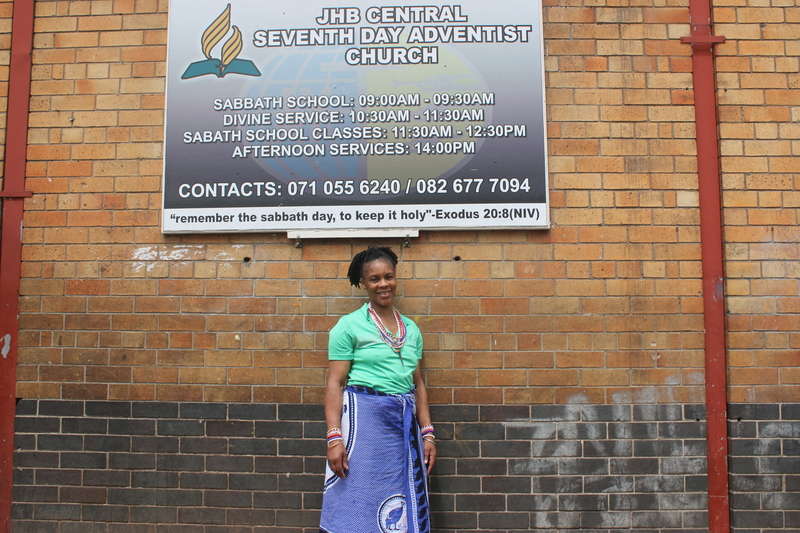 JOBURG SANGOMA: Sibonginkosi Mabena standing outside the Seventh Day Adventist Church, a building opposite hers. MEET GOGO LINQE: Gogo Linqe in her “indumba” (practice room) explaining how she conducts a consultation for a client. At first glance, there seems to be nothing out of the ordinary in her flat; a kitchen with built-in cupboards and two bedrooms however, she uses a corner in one of the rooms as her “indumba” (practice room) where she does consultations with clients. “Most of my clients are elderly people, youngsters who come here are often accompanied by their parents,” she says. Gogo Linqe is originally from Zimbabwe, she came to South Africa (SA) in 2000 looking for better job opportunities. When she arrived in SA she worked as a domestic worker for 12 years in different households around Johannesburg. She answered her calling in 2013 after years of resisting it. She says she grew up in a Catholic church up until she decided to come to South Africa. She says she has been aware since she was still a child that she had a calling to be a sangoma but her mother was against it, she says she thought to herself it would go away if she ignored it but it caught up with her even in her adult years. “I used to see things in my sleep including things that would eventually take place,” she says.Gogo Linqe had many “episodes” before she finally decided to answer her calling. She recalls one where she disturbed a taxi driver once and almost caused an accident as she was overwhelmed by the spirits of her ancestors and she grabbed the taxi driver by the hand and asked him why he was not taking her to thwasa School (initiation school for sangomas). One of the passengers realised that she was a person with a calling and quickly gave her snyf (snuff powder) to in hail to appease her ancestors. “A Zion prophet in the same taxi told me that I had to accept my calling or else I would die,” she says.She went to an initiation school in Diepsloot (a township in Johannesburg) where she graduated after training for 10 months. 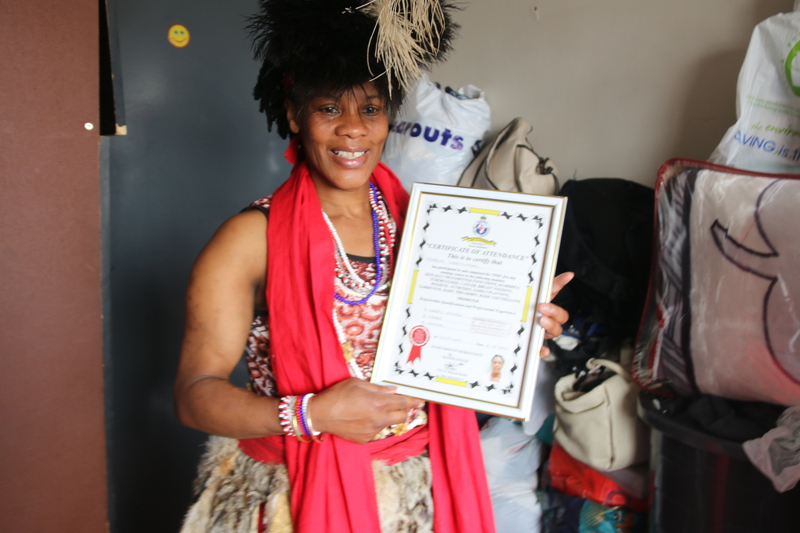 She says she finally felt like a load had been lifted of her shoulders when she finally accepted her calling and started practising as a sangoma. However, she would still face more problems after qualifying as a sangoma as it is easy for anyone to notice that she is a traditional healer because of her beads. “Sometimes that’s a good thing because some people come up to me and ask for my contacts because they need help but at times I face people who don’t know anything about being a sangoma and will start saying hateful things,” Gogo Linqe says. “Even now my mother who is a staunch Christian and I don’t get along as she still doesn’t understand the calling that I have,” she says with sadness in her eyes “but I still love her and try to reach out to her,” she adds. However her father has been very supportive and understands the nature of her calling. Both her parents still live in Zimbabwe. Gogo Linqe says with the help of traditional healer’s institutions which educate people about the work they do, when people see sangomas on the street they greet them with respect. “You would walk into a taxi and some taxi drivers would say thokoza Gogo,” she laughs. However, she says, there are still people who think when someone has idlzoi (ancestral spirit) they are demon possessed. “Healing people is a gift and in the olden days, our ancestors used to seek guidance from sangomas, they were gatekeepers of society,” she adds. Maseko says over the years, with the assistance of traditional healer’s organisations and the government, people’s perceptions about traditional healers have changed. “People are starting to embrace their calling despite sceptics,” she says. There are currently more than 200 000 traditional healers across the country of which more than 29000 are members of THO. Gogo Linqe says one of the myths that came with colonisation was that sangomas don’t pray or don’t know God. She says when you have a calling to heal people you pray even more for guidance from God “even when preparing medicine I pray,” she says. She uses bones, incense, candles when doing consultations. She also prepares medication using herbs to give to her patients. “I buy most of my herbs at a store in Faraday and sometimes my ancestors show me where to find a particular plant, “she says. “Abanye babengiqhwaba benginyathela bengikhaba besithi bakhiph’amadimoni (some were clapping and kicking me saying they were casting out demons) all because I attended church without taking off my beads,” she says sniffing snyf which is used to connect her with her ancestors when feeling their presence. However, she says at Revelation Church in Johannesburg down town, sangomas are allowed to get in without taking off their beads but they sit together in a different corner from other people. What causes stigmatisation of sangomas? “Some healers don’t use their gift appropriately, they harm people and they give us a bad name,” Gogo Linqe says. She says she was disturbed by reports that people with albinism were being murdered to make muti.“When I went to thwasa school for 10 months, we were never taught to make medicine using people’s body parts, I don’t know where it comes from, people who do that are not healers ngabathakathi (they are witches),” she says with a louder voice. She adds that pastors also have to continue preaching so that people stop doing “evil” things. “Sometimes the people who approach sangomas for evil doing are church goers but I turn them down, my ancestors would never allow such,” she adds. Gogo says most of her patients learn about her healing practice through word of mouth and through THO where she is also a member.“We conduct imihlangano (gatherings) where we are equipped with skills,” she says pointing at her certificates; one a certificate as a senior gobela (trainer) and the other certificate as a certified sangoma. 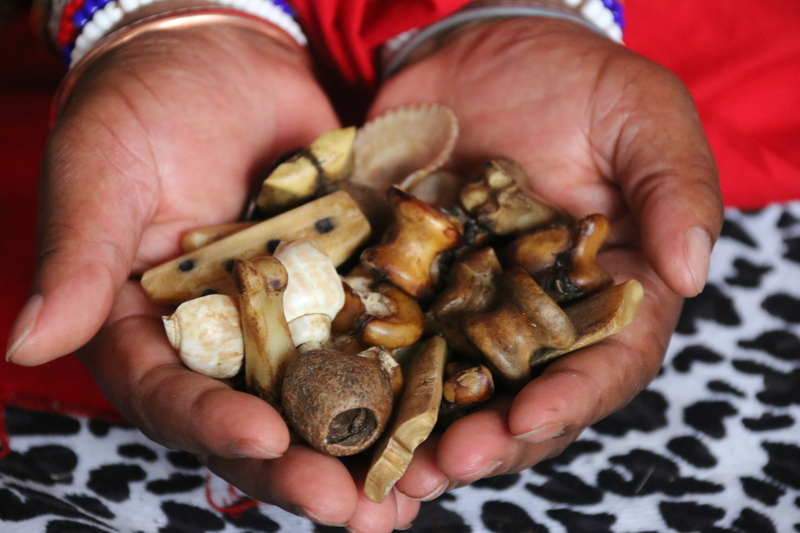 “Nowadays it’s important for patients to verify if a person is a certified sangoma before consulting with them to avoid ‘bogus’ sangomas,” Gogo adds. Gogo Linqe says she appreciates government efforts to try to regulate traditional healers to protect both healers and patients however, she says she is concerned about some of the additional regulations that have been proposed to be effective starting in February next year. “Government cannot decide how long a person must stay in training because that totally depends on the person’s ancestors, some people do spend a year but others spend three months and so forth and that does not mean they have robbed the process but instead it means that their idlozi matured faster,” she says. Gogo adds that on the proposed minimum age of 18 to be an “ithwasa (sangoma initiate), she says she understands the reason for the regulation. “Some people are called at an early age and once they have undergone ukuthwasa they are still not ready to take on the responsibility bestowed upon them and end-up displeasing the ancestors with the way they handle themselves,” she says. However, she insists that government should not impose such regulations on sangomas but instead should involve traditional healers when coming up with these policies. Gogo Linqe immediately got lost in the spiritual realm but quickly came back. “Where were we,” she asks but quickly remembers “ohh the traditional healers act”. QUALIFIED: Sibonginkosi holds her certificate with pride. She calls Sakhile, to go call another young sangoma who stays on a floor two stairs down from hers. Before she arrives, she tells us that the girl had to go to thwasa school at age, 17 because she became very ill. After waiting for a few minutes, Nontobeko Mondlana who goes by the name Gogo Maweni (sangoma name), 21, arrives. She is also wearing red and white beads and bows while clapping her hands when greeting us.She says she knew when she was still 11 years old that she had a calling but her family did a ceremony to plead with her ancestors to let her continue with school. She carried on studying until her ancestors could no longer wait so she abandoned her studies when she was still in grade 11.” Ignoring my calling led me to become very ill, I went from having kidney stones to having a stroke but doctors couldn’t help me my family and I knew it was time for me to accept my calling,” she says. She went to an initiation school called “Vuk’uzakhe” in the township of Thokoza. Mondlana strongly opposes the proposed government regulation on the minimum age to be an ithwasa. Maseko says she does not understand how the government can reach a conclusion of stipulating how old people must be when ancestors decide to call them. Mondlana is not a fully practising sangoma although she’s a certified one. She says she wants to be like other young sangomas who are academics and still practice as traditional healers.Despite some negative perceptions people may have of traditional healers in Johannesburg CBD, the traditional healers are determined to continue doing their work and carrying themselves with pride. Gogo Linqe and Gogo Maweni will be attending umhlangano to be held at the THO office in November in an effort to resolve the plight sangomas still face in modern society and will also be taught more about some medical procedures. “ukufund’akukhulelwa” (you never stop learning). Gogo Linqe laughs: “Vumani bo!” (agree with me).